Adrianna is a 28 foot c/c with a stright inboard diesel. 360 deg. of a pure fishing machine, this allows us to use the litest tackle to catch monster fish. To date the Adrianna has landed 23 Stripers over 50 pounds and 2 Stripers over 60 pounds, the biggest weighing in at 65.4 pounds. We use nothing but lite tackle, 20lb, 15lb and 6lb spinning gear. 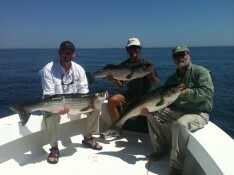 We have caught and landed Stripers up to 54 pounds on 15lb and Stripers up to 43 punds on 6lb gear. If you don't find exciting, then you better check your pulse ! !